Semi-desert, foothills. Open shrub and grasslands. Spring. This very slender Gilia has the typical Gilia basal rosette of leaves, tiny flowers that can range from white to blue to pink, and penchant for seemingly inhospitable, barren, hot ground. It is very common, but because it is so slender it goes unnoticed and unappreciated. The nomenclatural lineage of this plant is convoluted and disputed: It was collected prior to 1804 by someone, probably in America, grown from seed in England, and named Ipomopsis inconspicua in 1804. Frederick Pursh renamed it Cantua parviflora in 1814, Rydberg named it Gilia inconspicua in 1904, August Brand named it Gilia ophthalmoides, in 1907, and it has endured many other names in its two hundred year scientific history. Present day Gilia expert, Verne Grant, accepts the name, Gilia ophthalmoides subspecies clokeyi. Utah flora expert, Stanley Welsh, says, "...the large number of names is indicative of the variation within this and the other annual, small-flowered Gilias". Gilia laciniata, the first Gilia in the genus, was collected by Ruiz and Pavon in Peru or Chile and was named for Filippo Luigi Gilii (1756-1821), Italian clergyman and naturalist. The species name should be pronounced with a soft g (as in the "J" of "Joe): "Gee-lee uh". 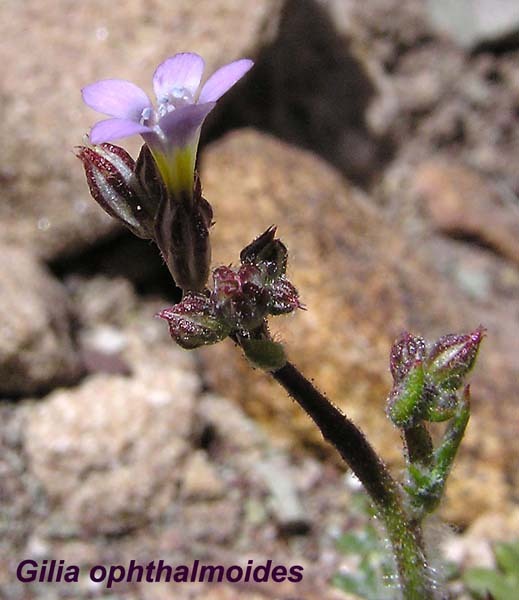 The genus Gilia is highly inclusive and variable and many of its members hybridize. The genus has been reexamined often and a number of its members have been placed into other Polemoniaceae genera: Giliastrum, Saltugilia, Navarretia, Ipomopsis, Aliciella, Allophyllum, Linanthus, etc. The species name, "ophthalmoides", is from the Greek for "appearing like the eye".